Using the Subaru Telescope, the CFHT and NASA’s GALEX, astronomers reveal unprecedented views of the star formation process of a Blue Supergiant star located in the constellation Virgo. A duo of astronomers, Dr. Youichi Ohyama (Institute of Astronomy and Astrophysics, Academia Sinica or ASIAA, Taiwan) and Dr. Ananda Hota (UM-DAE Center for Excellence in the Basic Sciences or CBS, India), has discovered a Blue Supergiant star located far beyond our Milky Way Galaxy in the constellation Virgo. Over fifty-five million years ago, it emerged in an extremely wild environment, surrounded by intensely hot plasma (a million degrees centigrade) and amidst raging cyclone winds blowing at four-million kilometers per hour. Research using the Subaru Telescope, the Canada-France-Hawaii-Telescope (CFHT) and the National Aeronautics and Space Administration’s (NASA) Galaxy Evolution Explorer (GALEX) revealed unprecedented views of the star formation process in this intergalactic context and showed the promise of future investigations of a possibly new mode of star formation, unlike that within our Milky Way. About one thousand galaxies reside in a cluster filled with million-degree hot plasma and dark matter. The Virgo cluster, the nearest cluster of galaxies located about 55 million light years from Earth in the constellation Virgo, is an ideal laboratory to study the fate of gas stripped from the main body of galaxies falling into the intra-cluster medium. Does star formation take place in the clouds of stripped gas? If so, how? Dr. Ohyama and Dr. Hota focused on the trail of IC 3418 to explore a potentially new mode of star formation. Dr. Hota has been collecting data from multiple telescopes since 2006 to understand this galaxy, which he first spotted in the GALEX data during his Ph.D. research. IC 3418 is a small galaxy falling into the Virgo cluster of galaxies at such a high speed (a thousand kilometers per second) that its blanket of cool gas strips off. As it passed through the cluster, its stripped-off cool gas formed a 55,500 light-years-long trail that looks very much like the water vapor condensation trail from a supersonic jet’s path. Hot plasma surrounds the trail of IC 3418, and it has not been clear whether the clouds of cool gas would vaporize like water sprinkled on a hot frying pan or condense further to form new young massive stars. The GALEX ultraviolet image shows that new massive stars do form in the trail. 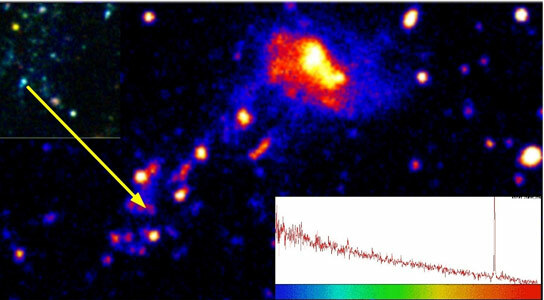 How did the stripped gas form new stars in the hot plasma? This process does not conform to star formation in our Milky Way Galaxy where massive stars develop in groups inside of stellar nurseries sheltered within giant cold molecular gas clouds. Dr. Ohyama suspected that a tiny dot of light emission in the trail of IC 3418 might be different from other blobs of ultraviolet light emissions in the trail. Spectroscopy of the little dot from Subaru Telescope’s Faint Object Camera and Spectrograph (FOCAS) revealed something stunning. Dr. Ohyama recalls, “When I first saw the spectrum, I was so puzzled, since it did not look like anything I had known of in extra-galactic astronomy.” Unlike typical star-forming regions, the telltale signs of stellar nurseries were missing. Intense UV-radiation usually ionizes/heats-up the surrounding gas when a star is born. Instead of any sign of heated gas, the observation showed fast winds blowing out of the stellar atmosphere at a speed of about 160 kilometers per second. Comparison with emissions from nearby stars made it clear that this massive, hot (O-type) star had passed its youth and was now aging; it was at a stage known as Blue Supergiant star and would soon face its explosive death as a supernova. Dr. Hota emphasized how important it is for astronomers to pay attention to this exotic system: “Precisely because the thermal and dynamic contrast of star formation that our research shows cannot be observed within our Milky Way, the details revealed by the Subaru Telescope’s spectroscopy and the deep, sharp imaging of CFHT are opening up a new avenue for investigating the baffling fundamentals of star formation.” Future in-depth investigations of this cocktail of hot plasma and turbulent, cold gas may reveal very different characteristics of stars, which may remain wild, exotic objects, challenging current theories of star formation. Be the first to comment on "Astronomers Discover a Blue Supergiant Star Born Outside the Milky Way"